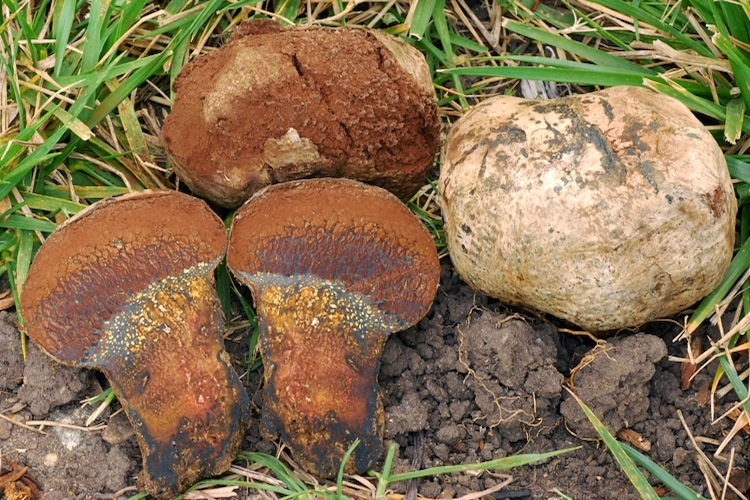 Pisolithus are really unusual members of the Boletales. All species look relatively similar to one another, and the genus can easily be recognized by their dingy or shiny dark, often golden or brownish, globular to irregularly rounded, hard fruitbodies that slowly disintegrate into a mass of brown spores. The young fruitbodies show many small 'capsules' when cut in cross section. All are mycorrhizal and extremely important in many forest ecosystems - they thrive in poor soil where trees struggle to gather water and nutrients and consequently tree saplings inoculated with Pisolithus are often employed by conservation technicians in reforestation projects. The single local species occurs with a wide range of hosts, both conifers and hardwoods. The yellow, gold, red, and dark brown pigments are highly valued by dye enthusiasts. Important identification characters are those used to separate the genus from other 'gastroid' species - the peridioles in the young fruitbodies are diagnostic, but the overall irregular stature and disintegrating tendencies along with the color of the mature spore mass set this mushroom far apart from all others.